Rachel Held Evans Archives - Book.Blog.Bake. With just the right mixture of humor and insight, Evans takes readers along with her on a lively adventure. In the process she discovers that the journey itself leads her right to the heart of God. I read a LOT of religious and theological books, partially because I have to for my degree (I have a minor in Religion), and partially because I find them interesting. However, I don’t typically review them because a review for a theological book is much, much different than a review for a fiction or even a memoir, and I just don’t think that many people would be interested in reading, plus, they’re typically not that fun to write. 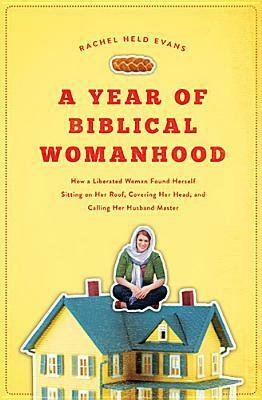 However, I put A Year of Biblical Womanhood on my Top Ten best books I read in 2012 list, so I decided to review this book, at least, since it can be categorized partially as a memoir. This is definitively a Christian book, but I don’t think that means that it’s marketed towards only Christians. I’ve followed Rachel Held Evan’s blog almost since the time I started college, and I find her writing refreshing and often a voice of reason. She does a good job of standing firm on matters when certain ideas may hurt people, but she also works to create a virtual room where people with different views can civilly discuss matters. I was expecting more of the same in her book, which is not really the case. For some reason, despite the personal nature of the project she undertook, I was thinking this book would be fairly objective. Instead, Rachel’s not afraid to open up some places of her heart that have been wounded by ideals of “biblical” womanhood, and in so doing, invites readers to be honest with themselves. That’s not to say that this is simply a memoir. Throughout the book, Rachel often visits some of the more troubling passages in the bible dealing with the treatment of women, and she’s not afraid to question what purpose they serve. Sometimes she arrives at answers, sometimes she doesn’t. This book is about the bible and “biblical”-ness, yes, but really, more than that, it’s about womanhood. Even though this book grapples with biblical issues, I think the reason this book could potentially appeal to someone without religious background is that this book really CELEBRATES womanhood, and what it means to a be a woman. And being a woman isn’t confined to being a homemaker OR having a career OR both. It can be all of those things or none of those things, and in so subtly declaring, really celebrates ALL women in ALL places. Final Impression: Even though I was expecting something different when I read this book, perhaps with a bit more snark and bite, I much prefer what I actually read. Rachel voices her opinions while still remaining reasonable and humorous, and I think it’s the type of book that could build bridges if we let it. The only reason I’m giving this anything less than five stars is because I can’t help but to compare it to Rachel’s first book, Evolving in Monkeytown, which I thought was just a tad bit better written, but still more than a worthwhile read. 4/5 stars.